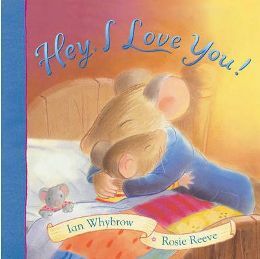 ‘Hey, I Love You!‘ is a wonderful picture story written for small children and tells the story of two mice and what happens when one forgets to tell the other that he loves him. In fact, this is a very interesting book because in fact there are actually two stories being told at the same time – one through the words written on the page and the other through the beautiful pictures! Close the curtains and turn on the light. safe where the Bad Cat can’t catch me! Big is reassured by this and after checking that they haven’t forgotten anything he goes on his way. Small does as the special words say to make sure he is safe, but just when he has done it all he remembers THEY HAVE FORGOTTEN SOMETHING! Therefore, he decides that he has to go after Big to tell him, so being very brave, he sets off on his way chasing and calling after Big who is always too far away to hear him! He follows him all the way to a barn where Big is finding something for supper. Sometimes Big thinks he hears noises along the way but there is always nothing! Finally in the barn, Big is collecting corn for the supper and we are told that Bad Cat is creeping up on him but he doesn’t hear! The cat gets closer and closer and is just about to pounce when Small shouts out to Big that they HAVE forgotten something! He shouts so loudly that he scares the cat who falls off the corn heap and runs for his life! And what was it they had forgotten? ‘We forgot to say I love you’ whispered Small! This is such a sweet story and beautifully told, but as I said before there is another story going on in the pictures! Bad Cat does not just appear at the end of the story which is what you would imagine if you were only hearing the words. No, he is there right from the start of Big’s journey, stealthily following him ready for the pounce! We see him waiting on a bridge, behind a wall and sneaking in the corn – but he is always half hidden so little children have to be quite observant to notice him. It is only because Big keeps thinking he hears something (which in fact he does as it is Little calling him) that he always hurries on a little faster and therefore inadvertently escapes Bad Cat. Therefore, unwittingly, Small has saved Big by being so keen to tell him he loves him! I think that by following this second story through the pictures make the ending even better! It makes my heart melt every time! The pictures are all lovely with a real hazy old fashioned feel to them. The mice live in a cute old fashioned cottage and wear little jumpers and jackets which make them seem like little people. The illustrator is Rosie Reeve and she has done a wonderful job in my opinion. So all in all I really recommend this book for a cosy feel-good read with your little ones! My daughters really enjoys following the picture story along with the words and get quite excited when the cat is getting close, but as we’ve read it a few times they know nothing bad happens at the end! They also really enjoy spotting the cat in all the pictures. No Comments on "Hey, I Love You!"